The elite Russian paratroopers are testing a new sniper rifle called ‘Tochnost’(‘Accuracy’), which can be put into service as early as next year. They have shown interest in this new weapon, developed by a Russian company. He pointed out that the rifle is being refined as trials take place. It is not clear yet how long the trials will last, but the weapon already has a high degree of readiness, Shamanov said. “It is highly probable that we will take it into service,” the commander said. This “accurate” rifle has been developed entirely by a private enterprise, ORSIS. The company produces the high-precision sniper rifle T-5000, also known within military circles as the “Russian terminator”. The T-5000 was recently unveiled at the ‘Army 2015’ forum in Moscow. The rifle is produced in three calibers. The barrel is made of single-cut stainless steel 416 R. Single cut technology is currently the most accurate of barrel-cutting techniques. All the main parts of the rifle are made of stainless steel, while box is aluminum. The rifle has a new four-chamber muzzle brake (compensator), which significantly reduces recoil. The rifle is equipped with a folding stock and a fuse. According to the manufacturer, each rifle has 1/2 minute of arc (MOA) accuracy guarantee. This is considering that the rifle is called sniper rifle when it guarantees less than a minute MOA accuracy. The rifle, performing with the accuracy of 1/2 minute, is an ultra-sniper rifle. The ‘Accuracy’ rifle, according to Ivan Ivanov, the manufacturer’s representative, the project is classified as ‘secret’. “Therefore, we cannot provide any detailed information,” he told ‘Rossiyskaya Gazeta’. However, ‘Rossiyskaya Gazeta’ has learnt that the rifle for the paratroopers will be little different from the T-5000. Another Russian company, CRI Tochmash, meanwhile, is currently working on the making a sniper rifle for the army. 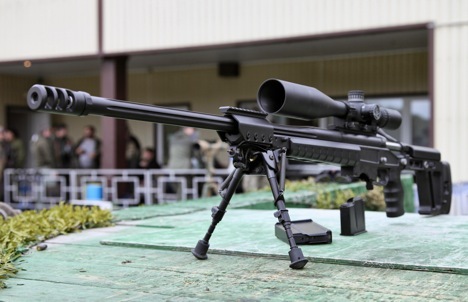 Earlier, Dmitry Semizorov, general director of CRI Tochmash, said official testing of the new 7.62mm sniper rifle will begin before the end of 2015. The creation of two sniper rifles at the same time is required because of different needs of the different forces, and is distinguished by the difference of their calibers. Smaller caliber bullets ensure maximum accuracy at distances less than 500 metres, while larger caliber bullets work well for distances over 500 metres. This is critically important for snipers for the special paratrooper forces. First published in Russian by Rossiyskaya Gazeta.